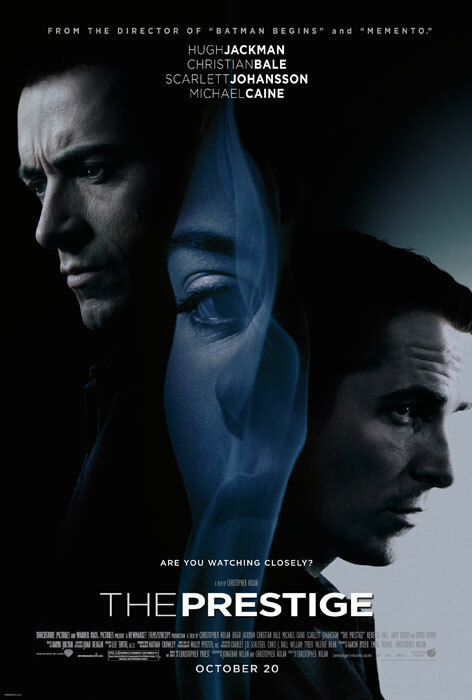 The Prestige is one of those movies with a hyped-up ending that doesn’t live up to the hype. And that, I suppose, is “the prestige” of this review. Otherwise, as far as the movie itself is concerned, “the pledge” and “the turn” are quite good (and overall, it’s much more enjoyable than that other magic movie, The Illusionist). Director Christopher Nolan (who wrote the screenplay with his brother, Jonathan — just like they did for Memento) keeps the story moving, with some decent twists and turns, and building to what should be an exciting climax. I suppose what ultimately kills The Prestige is the fact that it’s a movie about figuring out the “magic” behind the tricks. And when the secret is either predictable or not terribly interesting — or both — then you wish the illusionist had just stuck to the trick and not shown the reveal. I’m giving this movie a B+ for “the pledge” and “the turn,” but a B- for “the prestige” — an average grade of a B.